Are you planning a big family Thanksgiving celebration? While I have never personally sat down to a formal Thanksgiving meal, I know many people do each year. Traditional meals complete with placemats, cloth napkins and the families fine China and Silver are presented. If you are trying to plan a formal celebration and need some inexpensive decor ideas – this is a great option! 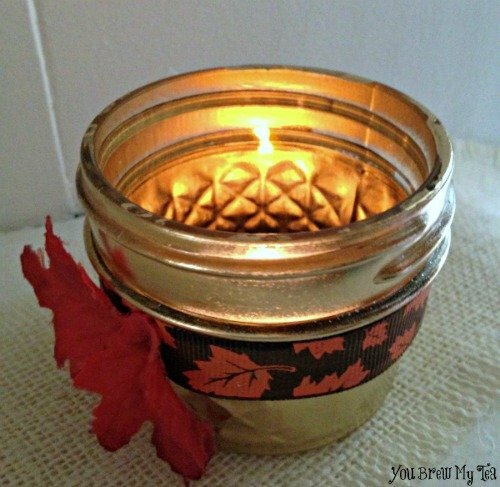 Katie F. is back again to share this tutorial for an Upcycle Jelly Jar Votive Holder. Not only is it cute, inexpensive and fun – it is upcycled! We love doing our part for the environment in everything – right down to our crafts! This was the perfect Thanksgiving decoration for us to share! Let’s check out her tips and tutorial for how to make this fun craft for your own Thanksgiving table this year! Make one as a centerpiece, or put one at each place setting! They are great for putting on the mantel for a soft romantic glow too! We found the fall leaves and ribbon we used for this craft at our local dollar store. It was perfect not only for the craft, but for our budget as well! Begin by placing the jelly jar on a piece of newspaper. Apply two coats of paint to the outside of the jar and allow plenty of time to dry. Wrap a length of ribbon around the top of the jar. Cut it to fit and secure it in place with glue. Embellish the ribbon with some silk leaves. Simply snip them, add glue, and press them to the ribbon. Pace your votive inside the jelly jar. A real votive or a battery operated votive will work great, and both can be found at your local dollar store. Now all you need to do is display your golden jelly jar votive holder! How beautiful would several of these look running across your mantel? 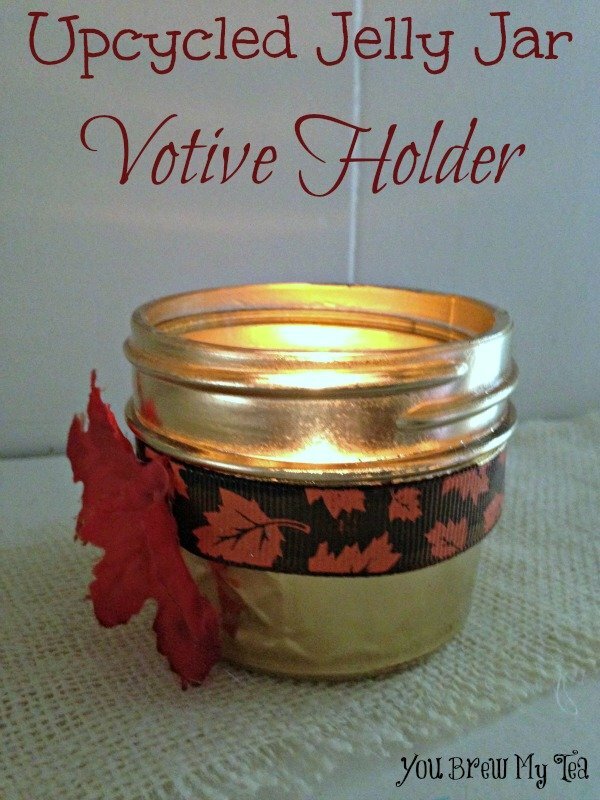 The gold will really come out when the votive glows through it, really letting you enjoy the feeling of fall. Make a few to place along the center of your table, at each table setting or around the room. We love how versatile these are too! You can easily embellish these with Christmas themed ribbons and holly leaves for a different look! Thanks again to Katie Fermia for sharing this great easy Upcycle craft tutorial with us! Make sure to check out her author page for more information about what she does! Don’t miss out on all of our great Fall Crafts! Are you a homeschooler? Check out our Free Fall Spelling Worksheets For Early Readers! Hello cute lady! This looks so beautiful. Pinned. We couldn’t think of anyone better to party with. We hope to see you tomorrow at 7 pm.